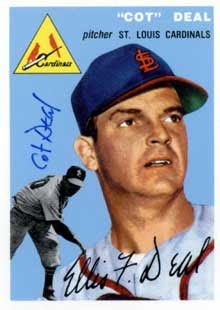 Ellis "Cot" Deal, who spent 50 years in professional baseball as a pitcher for the Boston Red Sox and the St. Louis Cardinals, as well as a coach for numerous organizations, passed away Tuesday May 21, 2013. He was 90. Deal's career is expertly detailed by SABR member Patrick Doyle in his SABR biography. Doyle's research on Deal's career also appears in the book, "Spahn, Sain, and Teddy Ballgame: Boston's (almost) Perfect Baseball Summer of 1948."